If you manage a team of professionals that work in the field or in tough, industrial environments, you know the challenges they face with technology. The average consumer device is just a bit too fragile and isn’t built for the factory floor worker or lineman’s needs. Nevertheless, their jobs demand an increasing level of technological access. Without it, your organization is at a competitive disadvantage in today’s mobile economy. While other industries have benefited from digital transformation enabled by smartphones, tablets and cloud-based applications, the lack of suitable ruggedized solutions has hampered the transition from paper-based processes to seamless mobile workflows in fields like transportation, logistics, construction, manufacturing and public safety. So what are the best technology options today for workers operating in tough, accident-prone environments? Many businesses are still leveraging legacy technology, such as two-way radios for communications or proprietary barcode scanners for inventory management. Others have opted to leverage consumer tablets with a ruggedized case to provide greater durability. But, in our view, the best option is a rugged tablet that’s purpose built to stand up to the challenges of virtually any environment. Our new Samsung Galaxy Tab Active2 provides just that. Its military-grade design can withstand harsh conditions, including drops, altitude, extreme temperatures, immersion, salt, fog and blowing dust. MIL-STD-810G testing and IP68 certification attest to the durability of the device. With this rugged tablet, workers can go about their business fearlessly. A water-resistant S Pen: The IP68-certified S Pen looks and feels like a typical pen, but allows your team members to easily jot down digital notes, sketch ideas or capture signatures. Replaceable battery: The long-lasting battery keeps your team connected up to 11 hours, but when that’s not enough it can be replaced with a spare to stay powered on. A heavy-duty POGO Pin connector provides rock-solid dependability to quickly connect and charge. Works with gloves: Enhanced touch capabilities allow touchscreen use while wearing gloves, as well as when water is splashed on the screen. The Galaxy Tab Active2 also includes all the core features you’d expect from our Galaxy line, including a Full HD display, and high resolution cameras front and back. It also offers biometric authentication options like fingerprint scanning for greater security, and facial recognition for a convenient, unlock-with-a-look experience. The challenges of digital transformation go beyond the hardware, however. Turning a rugged tablet into a business solution means developing the right partner ecosystem to deliver a complete end-to-end solution. See a full rundown of the MIL-STD-810G testing the Tab Active2 passed in this infographic. With the launch of the Tab Active2, we’ve worked closely with leading software solution providers to create turnkey solutions that address specific industry needs. Fleet Management: In transportation, we’ve partnered with Omnitracs and other telematics solution providers to create a rugged solution that can serve as an electronic logging device (ELD), enable a more real-time connected fleet and more satisfied drivers. Asset Management: For smarter asset management, the combination of the Tab Active2 and IBM’s Maximo Anywhere solution enables enterprises to better track equipment and reduce the cost and complexities of daily operations. Fast Scanning for Retail: Combining Scandit’s mobile data capture platform with the Tab Active2 enables retail and logistics workers at a rainy loading dock or refrigerated stock room to use the device to rapidly scan multiple barcodes at once. Related tasks such as bill of lading and product delivery signature confirmation are enabled with the S Pen. Mobile device deployments can be complex — any IT professional knows this. From initial configuration and security updates to ongoing management and support, rolling out new hardware presents challenges — doubly so when the labor force is scattered across multiple territories. Fortunately, Samsung Knox solutions (which are licensed separately) make mobile deployments much easier for IT admins. Knox Configure lets you customize a wide range of settings and preload applications, so that devices can be tailored to their intended use case, whether it’s barcode scanning, asset management or telematics. The Knox Mobile Enrollment solution lets customers enroll large batches of devices with their mobile device management (MDM) or enterprise mobility management (EMM) solution at once, quickly enabling them for field usage. Our Enterprise Firmware Over-the-Air (E-FOTA) service lets customers manage when system updates happen so that they can test the firmware first, preventing problematic company-wide errors or meltdowns. And, of course, the Knox platform integrates closely with the industry’s leading EMM solutions, so that you can manage device policies across the workforce to mitigate security risks. Businesses can also opt for Samsung’s own Knox Manage EMM, with features like whitelisting and blocklisting apps and websites, and remotely wiping lost or stolen devices. For enterprises who need additional help with their deployment, our Samsung Business Services mobility experts can help get them off to a quick start. Digital transformation is challenging for any enterprise, and when you throw in environmental conditions that are hostile to electronic devices, it’s doubly so. With the Samsung Galaxy Tab Active2, we make it easy for your workforce to go fearlessly and work seamlessly. 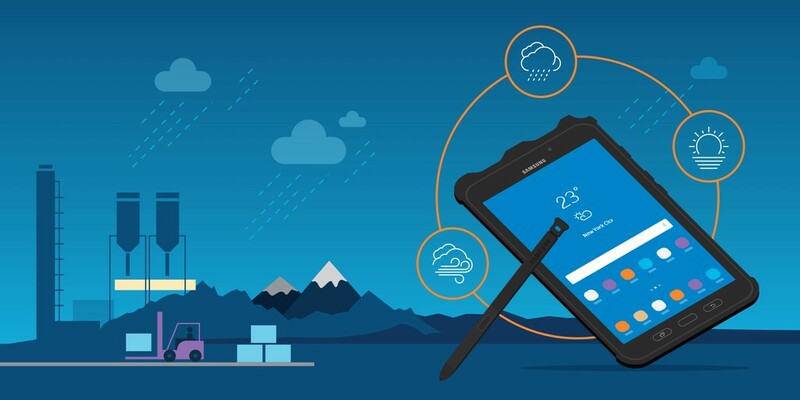 Learn how the Galaxy Tab Active2 can help solve your toughest business challenges.